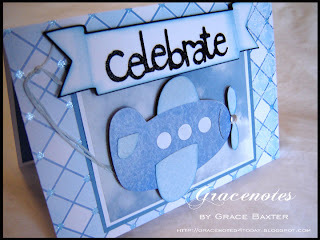 Grace Notes for Today: High Flying Birthday! 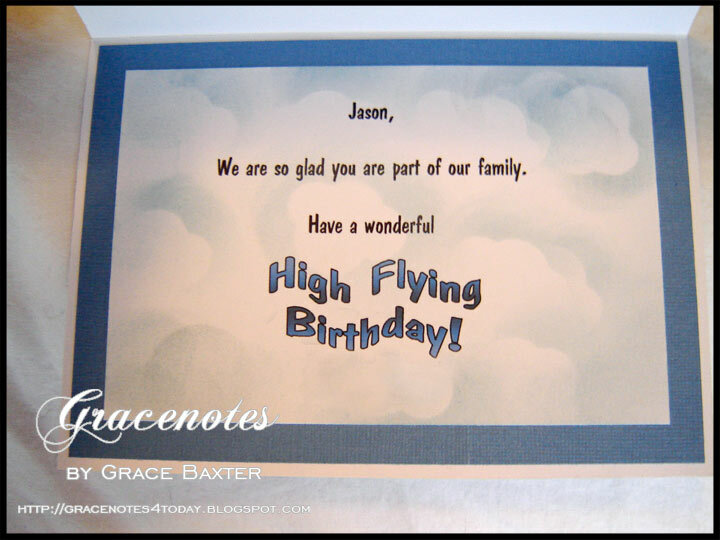 This birthday card features the recipient's favorite pastime... flying. 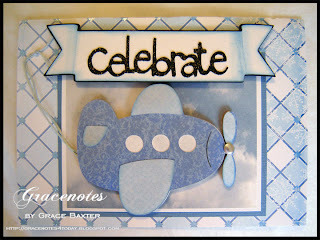 Working on getting his pilot's license, this young man often has his head in the clouds. The card size is 5"x7". The base is a wonderful argyle CS with a little shine at the junctures. The plane and banner are cut from New Arrival. 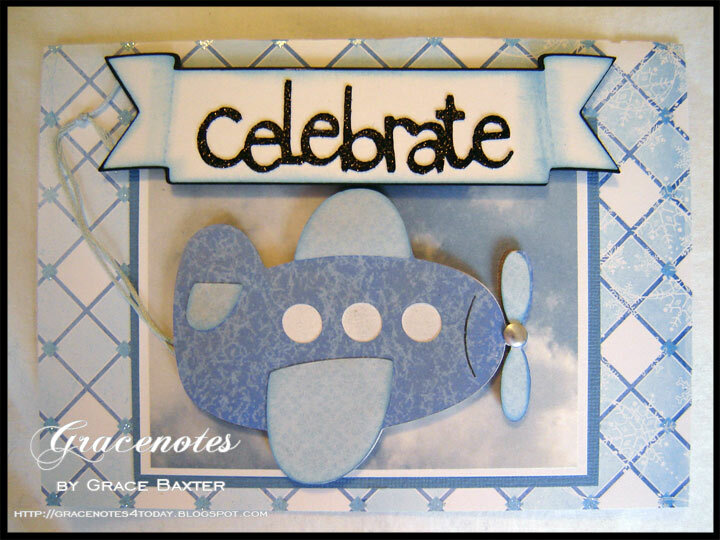 The sentiment "Celebrate" is from Celebrations. Makes sense, right? I don't need to give a lot of narrative about this one because it's self-explanatory. Both plane and banner are cut at size 3. I played around with trying to extend it in length using my Gypsy but the layers were just not matching up properly. After wasting far too much time trying to elongate the plane, I went with the shape, as is. On the front, I used real cloud paper. 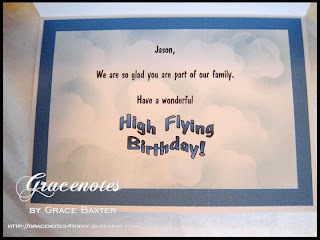 But inside, I created my own cloud background using ink and masking a cloud shape. The verse inside was created on my computer, printed onto white cardstock and then inked as described. Hope you like it! Note: My camera lighting is not very good today as it's a dark rainy day and I couldn't get it right. The first pic is more true to colour. Your work is inspirational. You and your family are beautiful. Looks like you live a wonderfully full life. 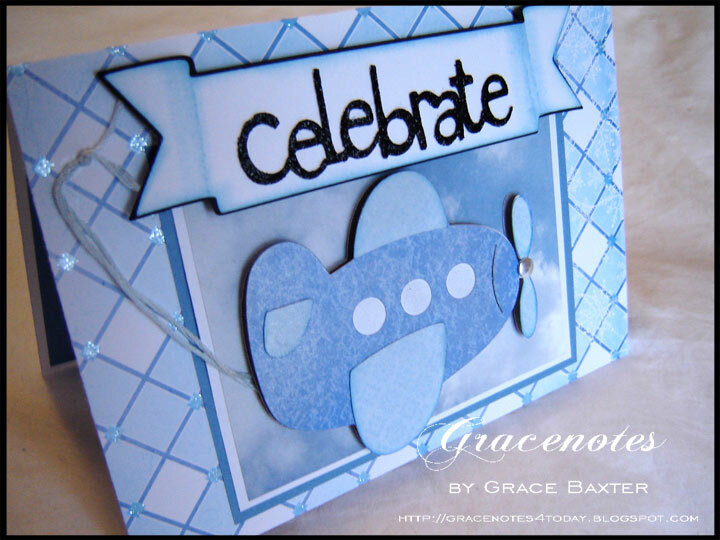 Hi Grace I have really enjoyed visiting your blog, you work is beautiful. It's nice to find another Grace.